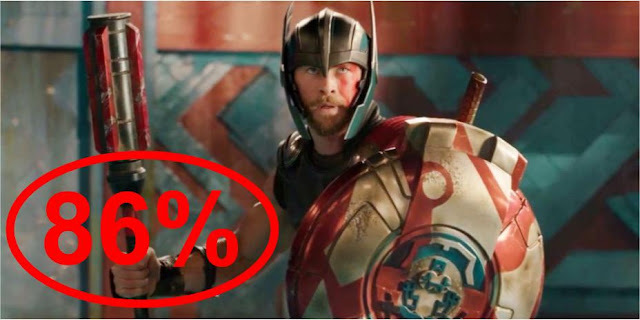 It's safe to say that the previous 'Thor' movies haven't lit audiences up like many of Marvel's other projects have done so. The first two films haven't been bad, they just haven't been particularly exciting or memorable. However, the same cannot be said for 'Ragnarok' as the film creates an exciting identity that is unlike any other superhero film that we have ever seen. After a family revelation, Thor (Chris Hemsworth) finds himself imprisoned on a strange planet by a man known as the Grandmaster (Jeff Goldblum). Whilst on this strange planet, Thor is forced to battle for his life and in doing so, he is reunited with fellow Avenger The Hulk (Mark Ruffalo). Together they must find a way to get off the planet and return to Asgard before the evil Hela destroys the entire civilisation. Comic book movies are often heavily criticised for lacking an identity that makes the film stand out from the others. Many claim that all the films look and feel the same whilst having similar if not identical plot points and storylines. With Taika Waititi directing 'Ragnarok', many were unsure to how much of his style would be replicated into this film as Marvel hasn't collaborated well with unique auteurs previously - see Edgar Wright and the 'Ant-Man' situation. However, Marvel have taken that risk they've held back on previously as 'Thor Ragnarok' is much more of a Taika Waititi film rather than a Marvel film. Waititi's fingerprints are all over this film as it is a straight-up comedy. Over the years, Waititi has proven himself to be a true force when it comes to comedy and has made two - now three - of the best comedies of the last decade. With Waititi, you know that you will be getting a barrel of laughs in the film with cleverly crafted jokes, gags and slapstick humour. 'Ragnarok' has the same identity of Waititi's other film that allows it to truly stand out from the pack. Nobody else could've made this film as it is so distinctive to anything out there or that we have seen before in a big budget superhero flick. Waititi has been rewarded for his hard work on smaller indie films and has followed the likes of James Gunn in showing why such bright, creative minds should be given chances on a much bigger scale. The film most definitely possesses its own unique visual style to allow it to stand out further from the previous MCU films. The colour palette of 'Ragnarok' is off the chart with bright blues, yellows and red/pinks which creates a vibrant look that matches the tone of the film. As the film is a complete joy to watch and is 130 minutes of complete fun, the bright colours only enhance the film's exciting personality. The brightness of the film, again, helps the film stand alone as it goes against the norm to create something truly unique. The colours also blend very well with the action as it adds more excitement to these adrenaline filled scenes, as well as simply making them more appealing to the naked eye. 'Ragnarok' still does fit into the superhero genre but offers many moments that again differentiate it from other films, most noticeably within its climax. The film doesn't have the same ending as every other superhero film as it offers a fresh situation with a different solution. A lot of time is dedicated to the heroes actually being heroes in this moment as it isn't just a showdown to end the film. Instead, there is an abundance of characters fighting to save others, sacrificing themselves and looking to save as many people as possible. There are genre tropes that are hard to avoid but 'Ragnarok' manages to offer fresh and new situations that allow it stand out from a story perspective as well as the nature of its tone and visual style. At this stage in the MCU, the films are still looking to develop the characters whilst adding many new ones at the same time and 'Ragnarok' does this tremendously. There are many regulars like Thor, Loki and Hulk who are yet again magnificent but the many new characters are great additions to the series. Tessa Thompson is the main example as Valkyrie, an independent tough female superhero who can hang with Thor and Hulk as she becomes an instant fan favourite. Waititi himself even appears as a rock creature Korg who manages to steal every scene he's in with his soft Kiwi accent. Cate Blanchette and Jeff Goldblum are two incredible additions to the already impressive cast and both commit to the wackiness of the film. Chris Hemsworth provides his best performance yet as the God of Thunder as his recent experiences in comedy films has helped his overall charisma as he truly shines. In previous films, he has sort of taken a back seat as others have stolen the show, even in his solo films. Hemsworth commands the screen and works tremendously well with the humour in what is his most enjoyable performance to date. His chemistry with Tom Hiddlestone is ever apparent as the two continue to impress working alongside together, with Loki continuously using his brother for his own good. Once again, though, Marvel does not completely nail the villain as Hela is often forgotten about for large periods of time. We spend a lot of time away from Asgard where Hela is causing havoc but we see very little of it and at times, she becomes a bit of an afterthought. Blanchette does commit to the role but some extra screentime would really have made her much more fearful to our heroes. There are a few scenes that show her capabilities but not enough to consider her as a great villain. The film can be accused of not offering much more than laughs but as a bona fide comedy, these complaints cannot merit too much. Overall, Taika Waititi brings a very welcome addition to the MCU that is also one of the years best comedies. This is easily the best 'Thor' film there has been as this stands out from the rest of the films in this cinematic universe. A fresh film within a genre that is considered to have some fatigue, 'Thor Ragnarok' is a complete joy from start to finish. So have you seen 'Thor Ragnarok'? If so, what did you think of the film? I hope that this review was useful for if you were planning on seeing the movie or not, I highly recommend that you do so! Once again, thank you for taking the time to read my review, it is much appreciated!